3D scans using CT/CBCT imaging have not only been applied to the visualization of an object but also to the generation of a physical model. 3D-printing technology is used for making a physical model, also known as, rapid prototyping or additive manufacturing has provided new possibilities for the diagnosis, surgical planning, prosthesis design, and student education in medicine and dentistry. The technology is totally different from computer-aided design (CAD) to computer-aided manufacturing, and models can be made using stereolithography, fused deposition modeling (FDM), laminated object manufacturing, selective laser sintering, and direct metal laser sintering. In endodontic treatment, a physical tooth model fabricated by 3D printing has been used for patient education and also in various cases such as the diagnosis of atypical root morphology and deciding its management, guided access preparation for calcified canals, determination and locations of root resorption, and surgical planning, guided periapical surgeries, autotransplantation. Zehnder et al., Kfir et al., and Byun et al. 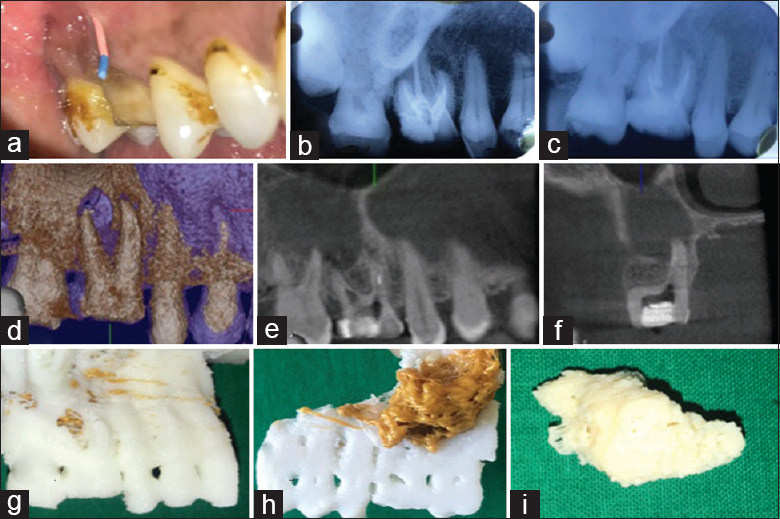 also used CBCT and intraoral optical scans to produce 3D printed templates/models to gain guided access to root canals, management of anomalous teeth with atypical root morphology. This case describes a surgical endodontic therapy, which takes advantage of 3D technology that is becoming increasingly accessible in dentistry. A 45 year old male patient with consent form reported to the department with a chief complaint of pus discharge in the upper right back tooth region for 1 year. The past dental history revealed a previously done endodontic treatment with 16. Clinical examination showed a draining sinus tract in the proximity of 16 [Figure 1]a. Gutta-percha (GP) tracing on radiograph showed area near the distobuccal root of 16 to be the cause of the infection with satisfactorily filled root [Figure 1]b. Tenderness on percussion was absent. Hence, the diagnosis formulated was previously treated 16 with chronic apical abscess (American Association of Endodontists 2013). Nonsurgical re-endodontic therapy with 16 was chosen as the first line of treatment. A multivisit re-endodontic therapy with GP removal followed by cleaning and shaping with rotary instrumentation (HyFlex CM) with copious irrigation of 3% sodium hypochlorite and saline with intermediate calcium hydroxide (RC Cal) dressing for 1 month was done and dressing was changed after every 7 days, and the healing of the symptoms were assessed. After the sinus tract healed and the canals were dry, obturation with GP (DiaDent) and resin sealer (AH Plus) with lateral compaction followed by a composite postendodontic restoration with 16 [Figure 1]c. However, the sinus reappeared after 2 months in the same region. Moreover, as the endodontic treatment had failed twice, a surgical approach was then planned. GP was removed again with the help of Protaper retreatment rotary files (Dentsply, USA), and CBCT was advised to rule out hidden pathology. However, the attempt was done for searching any missed canal with the help of radiograph (intraoral periapical radiography and CBCT) as well as dental operating microscope. CBCT was not showing any missed canal on its coronal sections. After confirming, calcium hydroxide dressing was given again until the surgery was done. On CBCT evaluation, a periapical radiolucency was revealed extending from the mesial border of 16 to the mesial border of 18 [Figure 1]d, [Figure 1]e, [Figure 1]f. The lesion was in close proximity to the maxillary sinus lining with an indistinct separation between the two. Hence, it was a challenge for the operator to ascertain the extent of the lesion and conclude whether the lesion encroached the sinus lining or not. This dilemma and limited information on the surgical procedure and the expected outcome made it difficult for the patient to accept the surgical treatment when the same was explained to him. The above circumstances made us opt for 3D printed models. These models (full model, cross section, and pathology) of the concerned region were helpful for the operator to determine the exact location, extent, and relation of the pathology to the maxillary sinus. From surgical point of view, since the maxillary posterior region presents its own difficulties, the models helped in decision-making regarding the bony window size. These models proved to be a boon as a definitive and predictable treatment plan could be formulated, and it served as a handy patient education tool. The patient could understand the need of surgery and expected outcomes of the same. Hence, it helped both the operator and the patient in multiple dimensions [Figure 1]g, [Figure 1]h, [Figure 1]i. 3D models exposed the presence of a pathology that was distinct from the maxillary sinus and was 2 cm × 2.5 cm in dimension [Figure 1]i. After obtaining the patient's consent and the preliminary investigations, surgical enucleation was planned. However, before surgery, calcium hydroxide was washed away from the canal with the help of sodium hypochlorite and saline, and the canals were dried using absorbent paper points. This was followed by obturation of the canal by GP (DiaDent) and resin sealer (AH Plus) with lateral compaction and postendodontic restoration using composite resin. 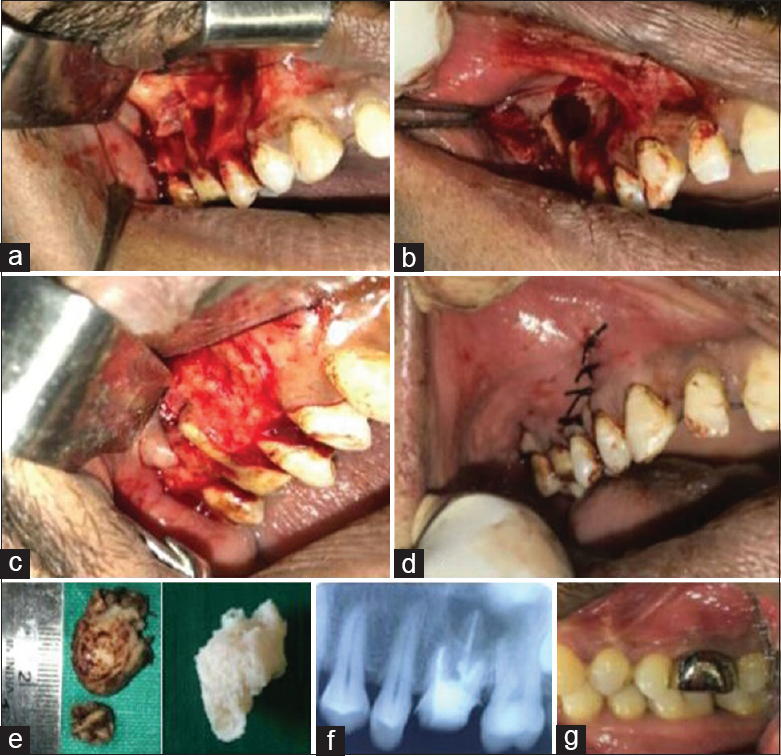 The pathology was then enucleated by reflecting a full-thickness envelope flap extending from distal border of 14 to distal border of 17 under administration of infiltration local anesthesia (lidocaine with 1:80000 epinephrine) [Figure 2]a and [Figure 2]b, and the mesiobuccal and distobuccal roots were resected at 2 mm. After that 3 mm of root-end cavity preparation with ultrasonic posterior retro tip, each followed by retrofilling with mineral trioxide aggregate (MTA) was done [Figure 2]c. Cavity was then irrigated with betadine and saline protecting the MTA with the help of a gauze piece after which the flap was repositioned and sutured using 3-0 silk suture by intermittent suturing technique [Figure 2]d. Postoperative antibiotic regimen was prescribed, and sinus protocol was advised. The patient was also advised to maintain the oral hygiene and a regular dental checkup. The histopathological analysis of the excised pathology confirmed the diagnosis of a radicular cyst. The patient was then recalled after 1 week for suture removal and follow-up that showed a healed sinus tract. 1, 2, and 3 months of follow-up showed no recurrence of any signs or symptoms. Hence, a full coverage metal crown was fabricated and cemented with 16 [Figure 2]f and [Figure 2]g.
Persistent apical periodontitis is preferably treated by root canal retreatment. However, posttreatment failure can still occur when treatment has been performed to a good standard. The infected site (s) may not be accessible by conventional therapy and therefore may require surgical intervention. This case presented a surgical dilemma that made it challenging to operate due to its location and proximity to the maxillary sinus, and it became mandatory to clear the understanding of the pathology present. CBCT scans helped in locating and determining the extent of the pathology. However, due to the closeness of the maxillary sinus and the consequences of the same, the patient was not convinced for the surgical treatment. CBCT has increased accuracy, higher resolution, and reduced scan time. CBCT eliminates superimposition of surrounding structures. It has a rapid scan time as compared with panoramic radiography and gives complete 3D reconstruction and display from any angle. CBCT is accurate and reliable in detecting apical periodontitis, vertical root fracture, and resorptive defects and gives a better view of root and pulp canal anatomy when compared to radiography. The accuracy of CBCT was 86% compared to 66% for periapical radiographs. Even though CBCT helped in accurate diagnosis and in treatment planning, the experienced operator will face a problem when he/she is treating unusual/difficult cases. Actually, 3D printed models are a replica of actual anatomy of the tooth which we get from CBCT. CBCT images are sent to 3D-printing laboratory in the form of DICOM files. In the laboratory, they are converted into Standard Tessellation Language (STL) format. STL images are represented in the form of Facets (collection of triangles) such as the CBCT images in the form of voxels. With the help of software after taking soft-tissue details, it is sent for the 3D printer for preparation of model. Model derived can be used as mock-up model, for patient education or for student's education or as a guide. Operators can perform the procedure on the model, and the same approach will be applied for the patient. In this case, the FDM technology 3D-printed model of different sections of the pathology was fabricated that alone gave an exact idea about the dimensions and position of the lesion in relation to sinus and was also helped in educating and convincing for the patient to go for the surgical treatment without any fear of entering the sinus. After enucleation, even the size of the excised lesion was almost similar to that of the 3D-printed model of the lesion , [Figure 2]e. This also approves of the accuracy of the 3D-printing technology as they have shown to have a discrepancy of < 0.1 mm. As the models were fabricated for the education and diagnosis purpose, FDM technology was used. In the todays era of digital dentistry, intraoral and CBCT scanners are becoming more mainstream, and dental professionals are becoming well acquainted and adapt at working with large volumes of digital data. Hence, developments and access to scanner technology and CAD software have made this technology easier to use. Enucleation was chosen as the treatment of choice due to good healing with primary closure of the wound and thorough evaluation of the cystic lining. Two millimeter of root resection followed by 3 mm of root-end cavity preparation with posterior retro tip was done. Edge of resection is flat (0°) since it minimizes apical leakage. MTA was used for retrofilling because of its biocompatibility and chemical bonding with the tooth and also bioactive potential. It shows the formation of calcium-phosphate precipitation at the interface. This interface layer reduces the risk of marginal percolation and gives promising long-term clinical success. Hence, 3-month follow-up after the use of a combination of novel 3D-printing technology and endodontic principles gave very satisfactory and promising results. CBCT is a diagnostic tool that may allow for the management of teeth with complex anatomy. 3D-printed models may be a valuable aid in the process of assessing and planning effective treatment modalities and practicing them ex vivo before actually performing the clinical procedure. Unconventional technological approaches may be required for detailed treatment planning of complex cases. The use of 3D printing in diagnosis, treatment of unusual and complex anatomy, surgical planning, patient education, and as mock-up models are the various applications that can help us achieve accurate and more predictable success in endodontics. Barone C, Dao TT, Basrani BB, Wang N, Friedman S. Treatment outcome in endodontics: The toronto study – phases 3, 4, and 5: Apical surgery. J Endod 2010;36:28-35. Scarfe WC, Farman AG. What is cone-beam CT and how does it work? Dent Clin North Am 2008;52:707-30, v.
Bornstein MM, Lauber R, Sendi P, von Arx T. Comparison of periapical radiography and limited cone-beam computed tomography in mandibular molars for analysis of anatomical landmarks before apical surgery. J Endod 2011;37:151-7. Zehnder MS, Connert T, Weiger R, Krastl G, Kühl S. Guided endodontics: Accuracy of a novel method for guided access cavity preparation and root canal location. Int Endod J 2016;49:966-72. Kfir A, Telishevsky-Strauss Y, Leitner A, Metzger Z. The diagnosis and conservative treatment of a complex type 3 dens invaginatus using cone beam computed tomography (CBCT) and 3D plastic models. Int Endod J 2013;46:275-88. Byun C, Kim C, Cho S, Baek SH, Kim G, Kim SG, et al. Endodontic treatment of an anomalous anterior tooth with the aid of a 3-dimensional printed physical tooth model. J Endod 2015;41:961-5. Siqueira JF Jr. Aetiology of root canal treatment failure: Why well-treated teeth can fail. Int Endod J 2001;34:1-10. Malik HH, Darwood AR, Shaunak S, Kulatilake P, El-Hilly AA, Mulki O, et al. Three-dimensional printing in surgery: A review of current surgical applications. J Surg Res 2015;199:512-22. Shibata E, Takao H, Amemiya S, Ohtomo K. 3D-printed visceral aneurysm models based on CT data for simulations of endovascular embolization: Evaluation of size and shape accuracy. AJR Am J Roentgenol 2017;209:243-7.
van der Meer WJ, Vissink A, Ng YL, Gulabivala K. 3D computer aided treatment planning in endodontics. J Dent 2016;45:67-72. Jain A, Ponnappa KC, Yadav P, Rao Y, Relhan N, Gupta P, et al. Comparison of the root end sealing ability of four different retrograde filling materials in teeth with root apices resected at different angles – An in vitro study. J Clin Diagn Res 2016;10:ZC14-7. Ravichandra PV, Vemisetty H, Deepthi K, Jayaprada Reddy S, Ramkiran D. Comparative evaluation of marginal adaptation of biodentine (TM) and other commonly used root end filling materials-an in vitro study. J Clin Diagn Res 2014;8:243-5.